Lá-Bas is the debut from a new Black Metal project from Stockholm called BLODSKAM. The band formed in 1998. Comprised of just two musicians, they successfully exploit their instruments to gain a raw, though monstrously huge sound. Like the greats, their true talent is evidenced by their keen ability of knowing which rules to break to achieve the desired effect. 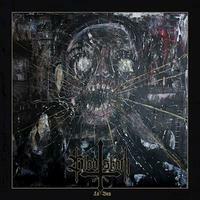 The first track, “Bödel,” is an example of raw filthy Black Metal with a classic feel. The guitar has a dirty, grainy tone like a fuzz pedal on anabolic steroids run through a stereo preamp with home speakers mic’d and re-amped with a Tube Screamer. In all seriousness, the guitar tone is excellent as it perfectly nails the staple TRUE black Metal sound with a rich exploration of the excess saturation of gain. The message is proclaimed loud and clear with the lyrics, “You are not my father. Satan is my father.” It then goes to mother and the second time through is extended to siblings. One riff is the backbone of the song and it is all pulled off with a steady medium groove. “My Home,” the third track features the band achieving a huge sound as things are slowed down. The bass lays a solid groove locked in with the steady pace of the drums as the guitar’s proverbial nails scratch the chalk board ever so pleasantly. The minor key is exploited perfectly to suit the desired vie and artistic statement. Less is more. When the solo occurs, it consists of steadily strummed notes over minor arpeggios supported all the while by the massive bass. This is such a mammoth-sized sound for only two musicians. Feedback is used decisively to expand the musical idea reminding me of what a Black Metal version of EYEHATEGOD may be. The fifth track, “The Machines,” is a proper fast-paced Black Metal anthem. Instead of tremolo-picking as expected, a hyper fuzz-infected riff explodes with the blasting. It is hard not to lock in to the groove they create when slowing down. Like many of the best riffs on here, slides are used deftly in forging the cause. BLODSKAM succeed in pushing the limits of the very extremities of the sonic aura of darkness. Like an ever-evolving shadow, the mayhem invoked self-replicates as it takes command of the listener’s many levels of consciousness. Hopelessness, despair, vile anger, and the sublime appreciation of all that is aligned with the left hand permeate the recording. With the DIY ethic of LEVIATHAN, the raw Punk-like groove of DARKTHRONE and KRIEG, and the deep-seated suicidal tendencies of BETHLEHEM, BLODSKAM have clearly done their homework in the construction of this project. this is top-tiered Black Metal – no vampires and Goth chicks – for true Black Metal fans. With a debut this good, I’m already anticipating their follow-up. Hail!